Through the years and devotion to persons over 50 years of age Nellie van Staden has become a household name in the Retirement Market. Nellie initially started in 1978 as an estate agent selling residential properties. In 1979 Nellie van Staden Properties was registered as a sole proprietor and changed to Nellie van Staden Eiendomme (Pty) Ltd in 2005. 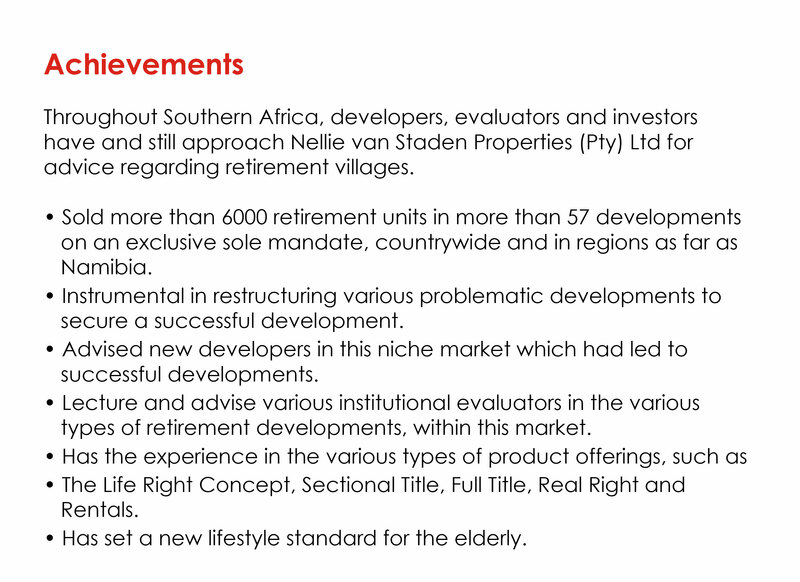 Since Nellie van Staden Eiendomme (Pty) Ltd focused on retirement developments by which new trends were set by being extensively involved in the industry and obtained first-hand experience of the needs and short falls in the retirement sector. NvS realized that in the future, retired persons will increasingly be responsible to provide financially for their own care and accommodation, due to the shortage of Government subsidized facilities. NvS was inspired to assist developers to provide accommodation, not only for the elderly, but also for the over 50 buyer where an active person can down scale from a large house with many responsibilities, but still retain their independence for as long as possible, with the knowledge that care services will be available when required later in life. Today both investors and persons of any age group can buy into a retirement village, as an investment, provided the occupant falls within the required age group of the Older Persons Act. Currently Retirement villages provide purchase options, catering for the major three categories in ageing. Retirement villages also provide an opportunity as an investment, based on market demand and competitive return on investment, which will generate a monthly income and capital growth. Retirement villages have the benefit that all individuals can invest at a younger age by buying a unit while renting it out for the interim.